Kasey Peach, a chemical engineering major, spent summer 2017 boating across Lake Coeur d’Alene, but he wasn’t sunbathing and waterskiing. Instead, he was intent on investigating the health of the lake. In 2017, Peach met with James Moberly, an associate professor in the College of Engineering. Peach was intrigued by Moberly’s research project examining the effects of the Silver Valley mining era on the lake’s sediment conditions. 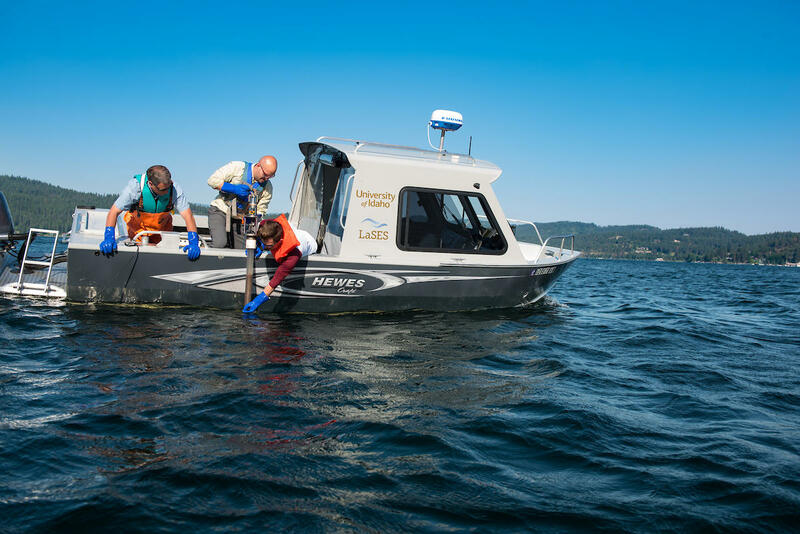 Previous research has shown that heavy metals from the mine have settled at the bottom of Lake Coeur d’Alene. Peach was eager to learn about the lake’s potential for induced anoxia, or lack of oxygen. Specifically, Peach and the team were concerned about whether toxic heavy metals originating from the soil from the Silver Valley mining area could be unearthed as a result of anoxia. Currently, the lake bottom does not lack oxygen. 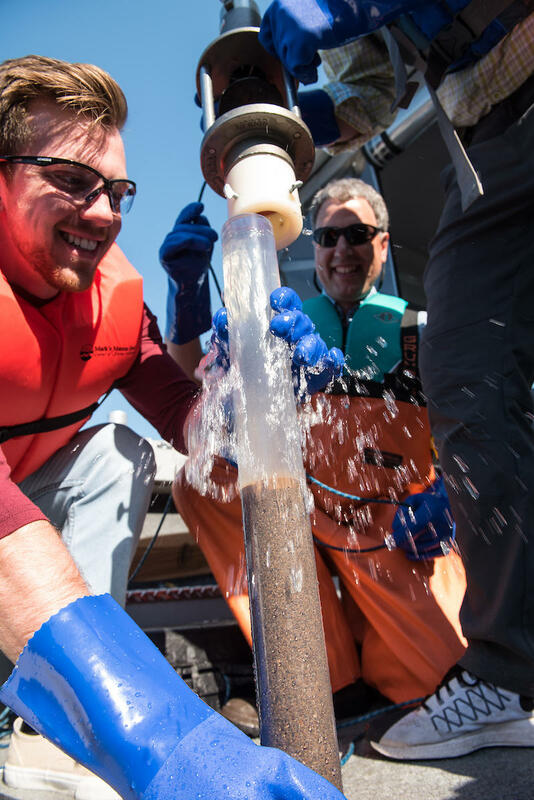 “We are curious if an algal bloom, which is a quick surge in algal growth that uses a lot of oxygen, could induce anoxic conditions and lead to the movement of bacteria up to the top of the lake bottom where they could potentially release metals into the water,” Peach said. Peach gathered sediment samples to measure the microbial activity on the lake floor. The project was funded by a grant from the Summer Undergraduate Research Fellowship program, a student-faculty research fellowship. Peach is still analyzing his data, but his preliminary findings indicate that there may be a flux of metals into the water and that the concentration of metals vary depending on lake depth. Although the additional metal in the lake water is not a devastating development for Lake Coeur d’Alene, the findings could be used to guide lake management, Peach said. He presented his work at a conference earlier this summer. Article and photos by Corinna Carney, a senior from Parker, Colorado, majoring in international studies. This project, “EPSCOR RII Track 1: Managing Idaho's Landscapes for Ecosystem Services,” was funded under the NSF Idaho EPSCoR Program and the National Science Foundation under award No. IIA-1301792. The total amount of federal funds for the project is $20 million, which amounts to 83% of the total cost of the project. The total amount of non-federal funds for the project is $4 million, which amounts to 17% of the total cost of the project. This project, “Idaho INBRE Program (INBRE-3),” was funded under the Institutional Development Award (IDeA) from the National Institute of General Medical Sciences of the National Institutes of Health under grant No. P20GM103408. The total amount of federal funds for the project is $16,403,369, which amounts to 100 percent of the total cost of the project.